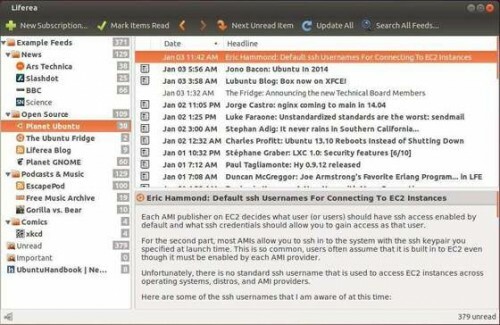 This simple tutorial is going to show you how to install the latest build of Liferea News Feeds in Ubuntu 14.04, Ubuntu 13.10, Ubuntu 12.10, Ubuntu 12.04 and their derivatives via PPA. As you may know, Liferea is a simple desktop news aggregator for online news feeds. There are many other news readers available, but these others are not available for Linux or require many extra libraries to be installed. Liferea tries to fill this gap by creating a fast, easy to use, easy to install news aggregator for GTK/GNOME. Permanently save headlines in news bins. Match items using search folders. 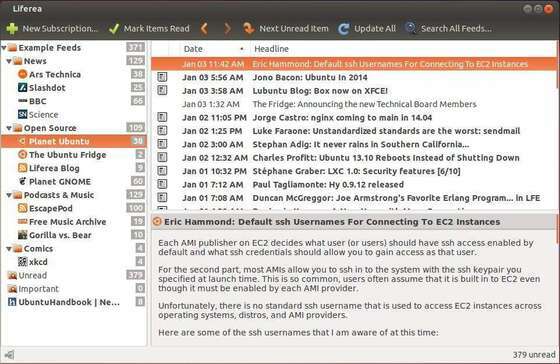 The default Liferea version in Ubuntu Software Center is old. To install the latest builds, besides building from the source, you can use a Launchpad PPA to make the install easy. No user responded in " Install Liferea News Feeds 1.10.7 in Ubuntu via PPA "